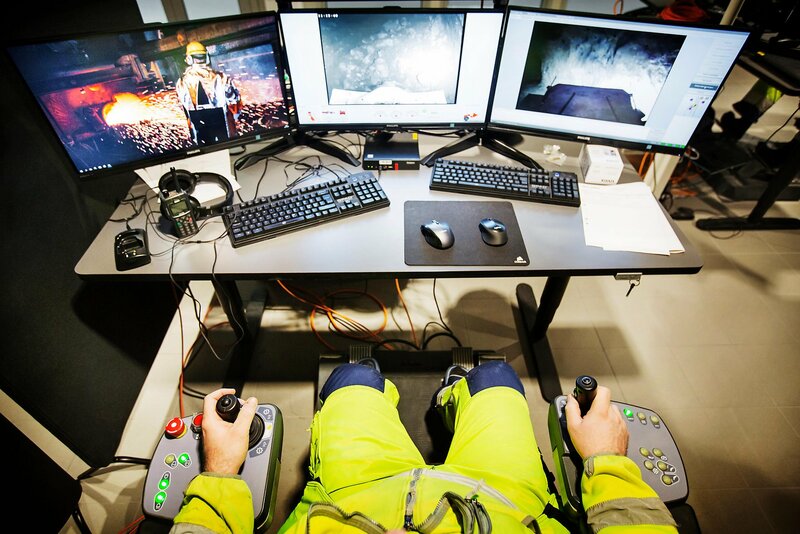 From inside the control room carved into the rock more than half a mile underground, Mika Persson can see the robots on the march, supposedly coming for his job here at the New Boliden mine in Garpenberg, Sweden. Persson, 35, sits in front of four computer screens, one displaying the loader he steers as it lifts freshly blasted rock containing silver, zinc and lead. If he were down in the mine shaft operating the loader manually, he would be inhaling dust and exhaust fumes. Instead, he reclines in an office chair while using a joystick to control the machine. He is cognizant that robots are evolving by the day. Boliden is testing self-driving vehicles to replace truck drivers. But Persson assumes people will always be needed to keep the machines running. He has faith in the Swedish economic model and its protections against the torment of joblessness. Americans tend to dismiss Nordic countries as a realm of nanny-state-worshipping socialists in contrast to the swashbuckling capitalists who rule in places like Silicon Valley. But Sweden presents the possibility that, in an age of automation, innovation may be best advanced by maintaining ample cushions against failure. The only way for the company to ensure profit is to continually increase efficiency. This is why Persson and his co-workers in the control room will soon be operating as many as four loaders at once via joysticks. The company is pressing ahead with plans to deploy self-driving trucks, testing a system with AB Volvo, the Swedish automotive giant, at a mine in the town of Kristineberg. There, Boliden has expanded annual production to close to 600,000 tons from about 350,000 tons three decades ago — while the workforce has remained about 200. At the mine below the frigid pine forests in Garpenberg, 110 miles northwest of Stockholm, Persson and his co-workers earn nearly $60,000 a year. They get five weeks of vacation. Under Swedish law, when a child arrives, the parents have 480 days of family leave to apportion between them. No robot is going to change any of that, Persson says. A 2016 study by the World Economic Forum surveyed 15 major economies that collectively hold two-thirds of the global workforce — about 1.86 billion workers — concluding that the rise of robots and artificial intelligence will destroy a net 5.1 million jobs by 2020. When ATMs landed at bank branches in the late 1960s, some foresaw the extinction of humans working in banks. But employment swelled as banks invested the savings into new areas like mortgage lending and insurance. Similar trends may play out again. But his robots never break for lunch. Today, Karlsson has six people working at his offices in the city of Malmo. He expects that Rosalinda will write 100,000 stories this year for various Swedish media outlets, bringing his company revenue of about $590,000. Sweden and its Nordic brethren have proved successful at managing such transitions. Job security councils financed by employers help people who lose jobs find new ones. Maintaining Sweden’s social safety net also requires that the public continue to pay tax rates approaching 60 percent. Yet as Sweden absorbs large numbers of immigrants from conflict-torn nations, that support may wane. Many lack education and may be difficult to employ. If large numbers wind up depending on government largesse, a backlash could result.